Every business owner is aware that once a sale is successfully negotiated, payments are received and the product or service has been delivered to the customer, one final step remains. A sales receipt allows your customers to keep track of their own purchases, building out their own trail of breadcrumbs not only for tax purposes, but also to keep track of their own workflow processes. How do I create a Sales Receipt in QuickBooks Desktop? 1. From within QuickBooks, go to Customers >> Sales Receipts. 2. You should now be seeing a blank Sales Receipt screen similar to the screenshot below. 3. Choose a Customer/Job from the dropdown list at the top-right of the screen. When the Customer/Job is selected, the Date, Sold To, Sale No., and Payment Method fields will be populated automatically with the Customer’s/Job’s info. 5. Fill out the Customer Message, Memo, and tax info if required. Click one of the Save buttons at the bottom of the screen. 6. You’re done! You have just created a Sales Receipt from your QuickBooks Desktop Account. 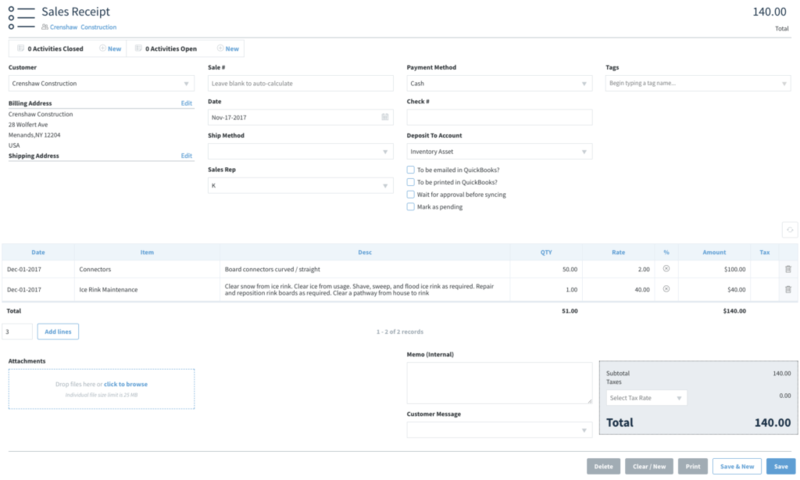 Can I create a Sales Receipt in Method:CRM that will sync with QuickBooks? You sure can! Method’s Sales Receipts App allows you to create receipts that let your customers to keep track of their own purchases, not only for tax purposes, but also to keep track of workflow processes.